The Taego order is one of the largest Zen orders in the world. The Taego order is one of the largest Zen orders in the world, and is the second largest order in Korea. We have over 3,100 Zen Temples in Korea alone. One of those temples, Seonamsa is a beautiful temple complex tucked away in the scenic mountains of Korea. It was originally built about 1300 years ago. Depending on its location and purpose, a temple may be home to one monk, or hundreds. Buddhism entered Korea over 1,600 years ago. In that spiritually fertile ground, early Buddhist thought (Theravada) was brought together with later developments (Mahayana) into a unified path leading to freedom from suffering. Masters in Korea were able to interact with the masters from China’s golden age of Zen, in the Tang and Sung dynasties. These great teachings are better preserved today in Korea than in China. Religion in general suffered a huge setback from the Cultural Revolution and communism in China. The Taego Order takes its name from Master Taego Bowoo, who ushered in a new era for Buddhism in his country. The various Sutra and Zen schools were brought together under one umbrella. 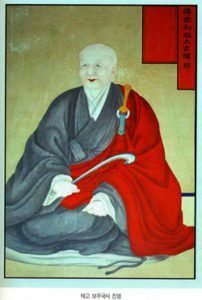 Before Master Bowoo’s time, there were five doctrinal schools and nine Zen schools that each strongly developed their own teachings and Sangha. Now, most Korean Buddhists consider themselves descendants of Master Taego Bowoo, including those in the Chogye Order. Taego monks and lay teachers have begun spreading around the world. This is due in part to the creation of ‘The Institute of Buddhist Studies’ (I.B.S.). Prior to 2004 the order consisted almost entirely of Korean monks. This was because the Taego constitution requires all monks to go to Buddhist College and graduate with an extensive Buddhist education before being able to fully ordain. This made it difficult for Westerners to become Taego Zen monks because the College and University Buddhist studies program were only taught in the Korean language. All non-Koreans had to first learn the language and then go to school full time in Korea for 4 years, which was quite a challenge for those who live outside of Korea. This all changed with the formation of the Institute of Buddhist Studies. In 1999, Ven. Dr. Jongmae Park, a Buddhist Director at the University of Southern California (USC) wrote an entire Buddhist studies program. In 2007, he made the program available as a ‘home study’ course and it was accepted as the equivalent to taking the Taego Buddhist studies program in Korea. Thus, for the first time in the history of Korean Zen, westerners were able to be schooled in English (and other languages) and to train as equals with Korean Taego Zen monks in Korea after graduation. They are also trained in temple retreat programs in the West under Ven. Dr. Jongmae Park and his senior disciples. Upon graduation, students get to travel to South Korea for a temple training program and full Taego ordination with their Korean counterparts. People are now taking the course from the comfort of their homes in countries throughout Europe and North America. The training slips seamlessly into their everyday lives. Ordained ‘Western’ Taego monks have the option to go to Korea and train in the wonderful atmosphere of ancient temples, vibrant with modern dedication to practice and helping sentient beings. They are warmly welcomed by their brother and sister monks as family and as the official representatives of the Taego Order outside of Korea. The Order also allows ordained Zen (Korean: Soen) monks to marry with the belief that a married monk can be a great asset in sharing the Dharma and in counseling with the lay community. Currently about half of all Taego monks are married and half of the monks are celibate (Both males and females are called “monk”, or Sunim). The Taego order is growing rapidly now outside of Korea under the leadership of Ven. Dr. Park. Some of the reasons that students say they are attracted to the order are: 1) It offers a non-sectarian Buddhist seminary program for monks and lay teachers, 2) Both education and meditation are encouraged, 3) There is an emphasis on taking the Dharma into local communities, 4) The seminary can be completed in a non-monastic setting, 5) Authentic monastic and lay ordinations, recognized in Korea and around the world, 6) Retreats are offered in multiple locations throughout the U.S. and Canada, and Europe, 7) There are opportunities to study abroad.